This was the best experience we had visiting Italy. Giovanni was our driver, he is a seasoned driver and very knowledgeable about each area. He was engaging and spoke english well. He dropped us off at each point of interest and let us wonder at our leasure. He was flexible with our pickup and drop off locations. I would highly recommend booking your own private driver. My wife and I took the day trip from Naples to the Amalfi Coast. Even though it was winter, we got lucky and it was a beautiful day. Probably best time to go is either May or October as summer is very hot and crowded. We were picked up at our hotel by our fabulous driver, Rosario. He is very experienced, nice and efficient. We then met our tour guided, Mariana. She is from Sorrento but knows ”the back of her hand” we first went to Ravello to avoid traffic. This is a beautiful, traditional village with great charm. We then went to Amalfi. Legendary beauty. Then on to Positano, where we grabbed a lunch. Finally, we finished up in a beautiful city - Sorrento. This is one of not the best tours we have ever been on. My husband and I were meeting his sister and parents in Naples for 3 days over Thanksgiving and I was put in charge of arranging tours. Even though this one was quite pricey, I booked it anyway as the Amalfi Coast was on all of our bucket lists and it had very good reviews. We were not disappointed. Maria and our wonderful driver (whose name I unfortunately cannot remember) met us right on time at our hotel and oriented us to what the day had in store. As this was the beginning off the off-season, many shops and restaurants were closed so they adjusted the itinerary a bit. We spent a chunk of time in Sorrento and Amalfi (where we had a spectacular lunch), but really just did photo stops in Positano and Ravello. On the way back, they drove us all the way to the end of the coast and returned via the highway rather than cutting back through the mountains half way. It was a very pleasurable drive with one breathtaking view after another. Be aware that this is a pretty fast moving tour with a lot of time in the car and not a lot of time in each place. 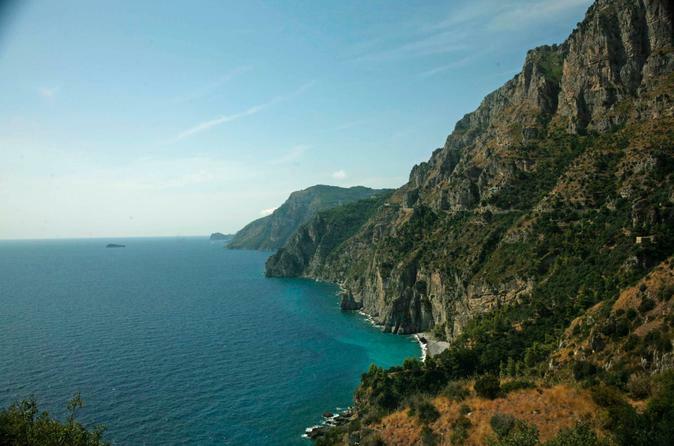 It's not the right tour for you if you are hoping to leisurely explore different parts of the Amalfi Coast. However, it was great for my family's attention span and very well organized. It helped that we lucked out with great weather and very low crowds. This was the most amazing private tour I have been on with Viator. Pepi was the most knowledgeable on locations, excellent restaurant recommendations, and the best driver in Italy on the planet. We enjoyed him immensely. He did everything with a smile, and was just generally a happy person who loved his job...and always asked if we needed a bathroom break! This was a 5 star excursion, the impeccable clean van and venue was superb! My driver Cherio was polite and safe driver,who spoke very good English I think the two cities you should spend most time inare Sorrento and Amalfi because there larger and have more to see in them. I think hour and halfin both would be better. The last two are smaller 30-45 minutes would be enough.The areas are all safe to stroll around. It takes hour and half to travel both ways.This is excellent tour. We had Rosario as our driver, he was great! We adjusted our tour a little and opted not to spend time in Ravello just stopped for picstures We wanted to spend extra time in Positano, it worked out perfect. If you want to have lunch in one of the places, you may have to shorten something because there may not be enough time for all of it. I recommend this tour for people who only have a day or two to spare and want to be able to squeeze everything in. Getting around southern Italy is difficult without a car, and the road are crazy so this was much more stressless experience than trying to drive ourselves I definitely would do it again. We had a great day with Dan, our tour guide and owner of the company. He communicated effectively about our pick up time and was exactly on time for our day trip. We had asked him to customize our trip as we wanted to see my husband's home as a child on Waimanalo. Dan stopped at some of the favored highlights on the way and on the North Shore. He was very detailed in the history of the sights and the Hawaiian culture. He took us to some of the tourist spots to see secluded beaches, macadamia nut, coffee and pineapple plantations, and a stop at a famed Guy Fieri Diners, Drive-ins and Dives rated food truck. We could not have asked for more! It was the highlight of our stay on Oahu. We made a friend in Dan and would highly recommend him for any of your touring needs on Oahu. My wife and I took the private car tour of the Amalfi Coast on July 25, 2018 from Naples. Our driver and guide was Rosario. We were picked up at our hotel, as promised, and on time, We were picked up in a late model Mercedes, which was super comfortable and luxurious. From the moment we stepped into the car, Rosario was friendly, courteous, and polite. The best thing about this particular tour is that it is truly customizable. 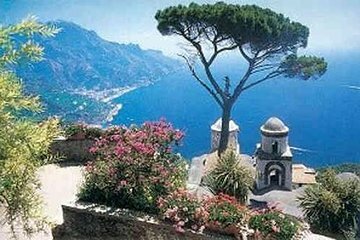 The tour included stops at Sorrento, Positano, Amalfi and Ravello. Since we had already been to Sorrento, we were able to bypass it, and spend more time in Positano. The Amalfi Coast was stunning, and all of the towns visited were amazing. Rosario was very informative, and made many stops along the way so we could take photos. He took us to an amazing place for lunch, literally on the side of the cliff, with stunning views of the coast line. Just be aware, that from Naples it is a lot of driving to see all of the towns. So please don't expect to spend a considerable amount of time in any one place. You will just get a tatse of each town. This is not a negative, it is just stating the obvious. All in all, a great tour, and a very professional driver and guide. We highly recommend this tour and Rosario to anyone interested in this itinerary. Alex and Tony picked us up promptly and conferred with us prior to starting our day. They were knowledgeable about the history of the area and shared great reccomendations. I would definitely use their services again. Amazing day with our driver Eiro R and guide Giuliana C. Picked us up at the Naples train station, Eiro was waiting for us outside the train station where he had messaged me he would be. Full day with beautiful sights. Giuliana was very informative with history and current events along the Amalfi Coast. She picked a beautiful restaurant for lunch, the views were amazing. It was such a romantic spot, sitting under lemon trees looking at the Amalfi Coast. Giuliana walked us thru several of the town centers, took pictures of us at every turn which we appreciated! Nice having Eiro take care of the car, as the coast is very busy and you don't have to worry about parking etc. Eiro and Giuliana made a birthday video to my son too! It was his birthday so I was sending Italian birthday greetings and they did a great job! Very appreciative of how nice and accommodating both were. We had a great day!